Washington has five major volcanoes: Mount Baker, Glacier Peak, Mount Rainier, Mount St. Helens, and Mount Adams. These volcanoes are part of the Cascade Range, a 1,200-mile line of volcanoes from British Columbia to northern California. Each of Washington’s volcanoes is still active. In fact, all of them except for Mount Adams have erupted in the last 250 years. Volcanoes do not erupt at regular intervals, so it is difficult to know exactly when or where the next eruption will happen. Many hazards come with living near volcanoes. Volcanic eruptions can send ash and volcanic debris into the air. Heat from the volcano can melt snow or ice and cause dangerous mudslides called lahars. Molten rock called lava can erupt and flow downhill, destroying everything in its path. Volcanoes are also beautiful mountains that many people visit each year for recreation. Volcanoes are the most visual result of plate tectonics, and are one of the few places on Earth where molten rock can reach the surface. There are even old volcanoes on other planets, such as Venus and Mars. Click below to learn more about volcanoes, their hazards, who is at risk, and how to prepare for an emergency. Mount Baker from its lofty height above Puget Sound. Photo credit: Jonathan Miske, Flickr (Creative Commons). Photo of Mount Baker taken from Skyline Ridge, circa 1922. Photo credit: Clyde Banks. Mount Baker circa 1981, with the Twin Sisters in the foreground. Photo credit: A. Fiksdal. Mount Baker produces andesitic lava flows, pumice, and lahars (volcanic mudflows). Lahar hazards are determined in part by figuring out where lahars traveled in the past. Evidence of massive lahars is still abundant in many of the valleys that drain Mount Baker. The map shows the distribution of lava flows and lahars mapped at the surface compared to hazard zones (gray shaded areas). Much of the volcanic deposits have been either eroded or buried by rivers, glaciers, and human development. Mount Baker is one of the youngest Cascade volcanoes, and erupts infrequently. Its last major eruptive period occurred about 6,600 years ago, where large portions of the flank repeatedly collapsed generating massive lahars. There are additional reports of eruptions and lahars from the 19th century, and as recently as 1975, fumarole activity and snow melt ramped up dramatically for several years. Steam and gas still issue from both Sherman Crater and the Dorr fumarole field on the northeast flank of the volcano today. Mount Baker holds the world record for most snowfall in a single season—95 feet in 1999! Short visual tour of Sherman Crater, Mount Baker summit fumarole field. Video by Dave Tucker. Sitting relatively low on the sklyline, Glacier Peak is mostly hidden from Puget Lowland residents, yet it is one of the more dangerous of the Cascade volcanoes. The volcano frequently and explosively produces dacitic lava flows, tephra, and far-reaching lahars (volcanic mudflows). Geologic mapping has documented the extent of previous lahar runout in the Skagit and Stillaguamish River valleys. While Glacier Peak has shown no sign of eruption in the last few decades, the lahars deposits in the river valleys from past eruptions are a reminder of the hazard Glacier Peak poses to the communities living in the valleys adjacent to the volcano. Lahar hazards are determined in part by figuring out where lahars traveled in the past. Evidence of massive lahars is still abundant in many of the valleys that drain Glacier Peak. The map shows the distribution of lava flows and lahars mapped at the surface compared to hazard zones (gray shaded areas). Much of the volcanic deposits have been either eroded or buried by rivers, glaciers, and human development. Glacier Peak erupts frequently. The eruptions are typically explosive and occasionally voluminous. Most eruptions involve tephra, but many were accompanied by far-reaching lahars and dome-building. Glacier Peak has erupted multiple times in the last 15,000 years. About 13,000 years ago, a series of large tephra eruptions occurred, accompanied by numerous lahars—one eruption was many times the size of the Mount St. Helens 1980 eruption. Within the last 5,000 years, the volcano produced frequent lava dome eruptions and subsequent dome collapse and lahars. The most recent eruption was only ~300 years ago. Dragovich, Joe D.; McKay, Donald T., Jr.; Dethier, David P.; Beget, James E., 2000, Holocene Glacier Peak lahar deposits in the lower Skagit River Valley, Washington: Washington Geology, v. 28, no. 1/2, p. 19-21, 59. Mount Rainier produces andesitic and dacitic lava flows, pumice, and lahars (volcanic mudflows). Lahar hazards are determined in part by figuring out where lahars traveled in the past. Evidence of massive lahars is still abundant in many of the valleys that drain Mount Rainier. The map shows the distribution of lava flows and lahars mapped at the surface compared to hazard zones (gray shaded areas). Much of the volcanic deposits have been either eroded or buried by rivers, glaciers, and human development. Modern Mount Rainier started erupting only 500,000 years ago with intermittent eruptions and mudflows thereafter. Mount Rainier still issues steam and gases from fumaroles near the summit crater. Heat from the fumaroles melts the snow and ice at the crater, as well as the summit icecap, forming caves beneath the ice. By studying the earthquakes, geologists monitor for rapid increases in seismicity (earthquakes) to hopefully be able to tell if the volcano is about to erupt. Geologists are particularly interested in a large north-trending fault zone west of Mount Rainier, called the Western Rainier Seismic Zone, which is an area of dense and shallow earthquakes. 5,600 years ago, a massive debris avalanche, called the Osceola Mudflow, poured down from the summit of Mount Rainier, picking up sediment and anything else in its path as it traveled down the White River valley and into the Puget Sound. The mudflow filled valleys with ~400 feet of sediment and moved at speeds of 40 to 50 miles an hour. Following the Osceola Mudflow, many smaller volcanic eruptions and lahars occurred as the volcano continued to show signs of unrest. The last major mudflow, called the Electron Mudflow, began as a part of a crater collapse and traveled down the Puyallup River into Sumner in ~1502.It is estimated that Mount Rainier has generated about 60 of these large lahars in the last 10,000 years. Many of the communities between Mount Rainier and the Puget Sound are built right on top of these deposits. Pringle, Patrick T., 2008, Roadside geology of Mount Rainier National Park and vicinity: Washington Division of Geology and Earth Resources Information Circular 107, 190 p.
Mount St. Helens produces dacitic to andesitic lava flows, pumice, and lahars (volcanic mudflows). Like Glacier Peak, the composition of its magma makes it erupt more explosively than other Cascade volcanoes that erupt andesitic lava. The areas prone to lahars are determined in part by figuring out where lahars traveled in the past. The map shows the distribution of lava flows and lahars mapped at the surface compared to hazard zones (gray shaded areas). Evidence of repeated eruptions can be found in many of the valleys that drain Mount St. Helens. Mount St. Helens was formed from four eruptive stages starting ~275,000 years ago, and intermittent eruptions occur to this day. During one such eruption around 2,000 years ago, lava flowed down the side of the volcano in streams. One such stream formed the Ape Caves, a spectacular 13,042-foot-long lava tube on the southeastern flank of the volcano. From March 16 to May 18 in 1980, a series of earthquakes, steam explosions, and small eruptions at the summit signaled a new eruptive phase of the volcano. By mid-April of 1980, a large bulge of new volcanic material had formed on the north flank of the mountain and moved outward at an average rate of ~5 feet per day. On May 18th, the cataclysmic eruption was triggered by a magnitude 5.1 earthquake. The bulge collapsed in a series of three massive slide blocks. This bulge collapse generated a chain reaction, starting with the largest avalanche in recorded history (0.6 cubic miles of material, reaching speeds of 60 miles per hour). The removal of this material decreased the pressure holding back the magma and caused the sudden release of gas, large rocks, and smaller particles to move across the landscape and destroyed most vegetation at an astounding speed of 650 miles per hour. This initial blast caused major lahar flows, pyroclastic flows, and an ash eruption that formed a eruption column that grew to 12 miles high and 45 miles across. In addition to ash, pyroclastic flows and lahars traveled swiftly across the Pumice Plain and down the North Fork Toutle and Cowlitz Rivers, destroying houses and bridges along the way. Time-lapse reconstruction of the lateral blast, courtesy of Joseph Friedman. In September of 2004, earthquake swarms were observed along with minor explosions and lava dome growth in the summit crater. For the next 3+ years, lava continued to build up in the crater and generated a lava dome that grew to a height of 1,500 feet. This activity continued steadily until late January of 2008. Lidar imagery of dome building at the summit of Mount St. Helens. Imagery from 2002 to November of 2004. Time-lapse images of Mount St. Helens dome growth (2004–2008). Mount St. Helens is located along a 65-mile-long zone of intense earthquake activity called the St. Helens seismic zone. Many small to moderate (up to 5.5) magnitude earthquakes occur in this area. Geologists monitor the earthquake activity very closely to look for signals of another eruption. Pringle, Patrick T., 2002, Roadside geology of Mount St. Helens National Volcanic Monument and vicinity; rev. ed. 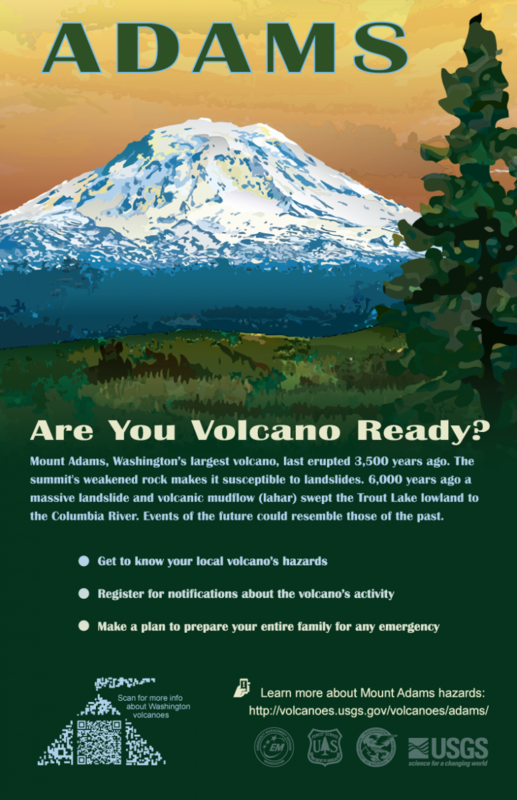 : Washington Division of Geology and Earth Resources Information Circular 88, 122 p.
Mount Adams is volumetrically the largest volcano in the Pacific Northwest. It is actually a cluster of volcanic vents that erupted andesitic lava from the vent cluster rather than a single vent. The Mount Adams system is one of the youngest in the Cascade Range and is situated further inland than most Cascade volcanoes. Distribution of lava flows and lahars mapped at the surface compared to hazard zones (gray shaded areas). Much of the volcanic deposits have been either eroded or buried by rivers, glaciers, and human development. There have been no historical eruptions in the Mount Adams volcanic field. The volcanic center first erupted between 520,000 and 500,000 years ago, and continued up to about 1,000 years ago. However, there were a series of debris avalanches and lahars between ~600 and 300 years ago. Hydrothermal alteration is present on the main cone as well as at numerous locations along the slope. Fumarole activity was reported at the summit from miners trying to extract sulfur from the crater in the 1930s, but later reconnaissance trips did not reveal any fumaroles—only the faint smell of sulfur. Residents throughout the state of Washington are at risk of volcanic hazards. There are five active volcanoes in Washington, and more than seven others in the rest of the Pacific Northwest. These volcanoes tend to erupt explosively and can cause significant damage both near and far. High-speed flows of hot ash and rock, lava flows, and landslides can destroy homes and infrastructure within ~10 miles of the eruption. Enormous mudflows of ash, debris, and melted ice—called lahars—can devastate low-lying areas more than 50 miles away. Know your risk! Learn what volcanic hazards exist near your home, place of work, or where you recreate. Natural hazards interactive map showing information relating to volcanic hazards—information displayed on the map was modified from USGS simplified volcanic hazards maps, listed below. Click the icons below to see the USGS simplified volcanic hazard zone maps for communities around and downstream of our major stratovolcanoes. There are 5 main types of volcanic hazards. Most of these hazards are associated with eruptions, but some, such as lahars, landslides, and volcanic gas can occur at any time. When a volcano erupts, the blast sends gas and pieces of molten rock into the air. Lighter pieces, such as volcanic glass, minerals, and ash can rise high into the air and form a massive cloud called an eruption column. The larger pieces—called volcanic bombs—usually fall quickly to the ground with a few miles of the volcanic vent. When eruption columns become large, they pose a serious hazard to health and aviation. The small particles of dust, rock, and volcanic glass—called ash—can be inhaled and cause lung damage. Ash is also damaging to airplanes if they fly through the ash cloud. Eruption columns and ash clouds can become enormous and extend for hundreds of miles. The 1980 eruption of Mount St. Helens covered over 22,000 square miles with ash. This is considered to be a relatively small volcanic eruption. Larger eruptions, such as the 1883 eruption of Krakatoa in the south Pacific, produced enough ash to slightly lower the temperature of the entire earth for several years. This diagram shows the sizes of a few volcanic eruptions. Smaller eruptions are much more common than larger ones. Diagram from the U.S. Geological Survey at http://volcanoes.usgs.gov/images/pglossary/eruptionsize.php. Molten rock that reaches the Earth's surface is called lava. Some types of lava (such as basalt) have low viscosity, move very quickly downhill, and can travel great distances. Other types of lava (such as rhyolite) have high viscosity, move very slowly, and cannot travel very far. Many volcanoes in the Cascade Range can erupt different types of lavas. For example, the Ape Caves near Mount St. Helens were created about 2,000 years ago by low-viscosity basalt that travelled many miles from their vent on the slope of the mountain. Later, during the 1980 eruption, Mount St. Helens created a high-viscosity dacite dome over 1,000 feet tall. A pyroclastic flow is a very dangerous and fast-moving mixture of ash, rock, and gas. The root word 'pyro' means fire and 'clastic' means rock. These flows can reach temperatures of more than 1,500°F and reach speeds of 100–150 miles per hour. They often occur as hot ash and rock move down the slope of the volcano, or as a result of volcanic collapse during an eruption. Pyroclastic flows will destroy nearly everything in their path. During the 1980 eruption of Mount St. Helens, pyroclastic flows destroyed nearly 230 square miles of forest. Trees 6 feet across were knocked down like twigs over 15 miles from the volcano. When enough water mixes with loose volcanic ash and rock on the side of a volcano, the mixture flows downhill and forms a lahar. In Washington, these mudflows can travel more than 50 miles from the volcano (sometimes reaching the Pacific Ocean!) at speeds up to 120 miles per hour. Some lahars can contain so much solid material that they look more like rivers of concrete. Lahar in Semeru, Indonesia (2003). Lahars can occur at almost any time and do not need a volcanic eruption. The water that forms lahars can come from snow and ice that were melted by heat from the volcano or from hot pyroclastic flows. The water can also come from intense rain events. Lahars have typically been the deadliest volcanic hazard because they can happen at any time and affect people far downstream of the volcano. Landslides and debris avalanches can occur on the slopes of volcanoes at any time. Because volcanoes are built of layers of ash and rock, their slopes can be relatively loose and weak. Groundwater and the circulation of hot acidic water from the volcano can alter minerals and make the rocks even weaker. Strong ground shaking during an earthquake, a volcanic eruption, or simply heavy rain or melting snow can trigger landslides on volcanoes. Landslides can also occur during an eruption if a part of the volcano collapses. For example, part of Mount Shasta in northern California collapsed about 300,000 years ago and created a giant landslide over 30 miles long. The deposits of this landslide are where the cities of Weed and Yreka are now built. Volcanoes release gas both during eruptions and between eruptions. During eruptions this release can be very explosive and is often what propels the ash and rock into the air. As magma is formed deep in the earth it contains small amounts of gas under very high pressure. As the magma moves towards the surface it is so thick that the gas cannot expand. When the volcano erupts it is like opening a soda can that has been shaken up! Between eruptions, much of the gas a volcano creates is steam. This steam is made when groundwater interacts with the hot interior of the volcano. The steam rises through cracks and can eventually reach the surface. At the surface it can form fumaroles, mud pots, or hot springs. The rising steam can also melt snow or ice, potentially causing lahars or landslides. In addition to steam, volcanoes can also release more dangerous gas, such as carbon dioxide, sulfur dioxide, hydrogen sulfide, hydrogen, and fluorine. These gases can react with water in the air to create acid rain. Heavy gas, such as carbon dioxide, can be trapped in low-lying areas and suffocate animals or people. With increasing numbers of people living near volcanoes in the Pacific Northwest, it is important to be able to give adequate warning before a major eruption. Volcanoes are part of a complex geologic system that operates on a time scale of tens to thousands of years. We know that all of the Cascade Range volcanoes are active and have had major eruptions in the past 400 years, but many lie dormant for centuries. It is certain that they will erupt again, but we cannot predict exactly which one will erupt next. Volcanoes have been erupting in the Cascade Range for millions of years. During the past 4,000 years eruptions have occurred at an average rate of about two per century. This chart shows 13 volcanoes on a map of Washington, Oregon, and northern California and time lines for each showing the ages of their eruptions. Figure modified from USGS General Information Product 63. Our best defense against volcanic hazards is through careful monitoring. Large numbers (10s to 1,000s) of small earthquakes sometimes happen right beneath a volcano as magma moves through the interior plumbing. Sometimes these earthquakes are a warning sign that an eruption may occur. Sometimes they are simply reminders that volcanoes are constantly changing. Not all earthquakes near a volcano mean that it will erupt. Some volcanoes have erupted without any seismic warning. These efforts enable early detection of possible eruptions. Close monitoring of Mount St. Helens enabled evacuation notices to be issued prior to the major eruption. Volcanic eruptions and lahars are frightening natural disasters. It is important to prepare ahead of time. The eruption of Mount St. Helens on May 18, 1980 killed 57 people, destroyed 27 bridges and almost 200 homes, and caused disruption for thousands of people. You can minimize damage and loss of life by being prepared for a volcanic emergency. One of the most important things you can do is learn about your risks. The following information is synthesized from the Cascade Volcano Observatory, Washington Emergency Management Division, and Ready.gov web sites. Learn about your risks—Know the danger and hazards you face at home, at work, and where you recreate or travel. Plan ahead. Have emergency supplies, food, and water stored. Plan an evacuation route away from streams that may carry lahars or landslide debris. Make sure your emergency provisions contain a pair of goggles and disposable breathing masks for ash and dust. Make a family emergency plan so that you know how to contact your family members in case of an emergency. Stay informed: Listen to media outlets for warnings and evacuations. Listen for All Hazard Alert Broadcast sirens that warn of lahars. Check out the Volcano Notification Service to subscribe to alerts about specific volcanoes. 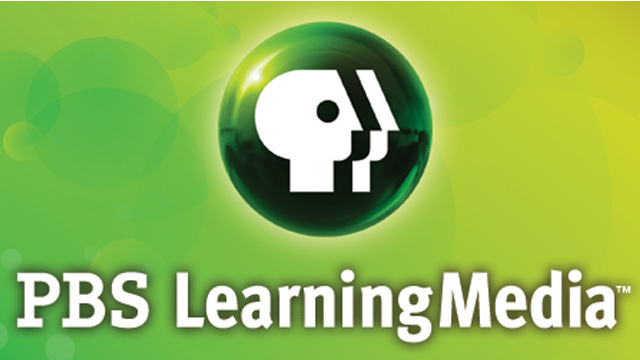 Ask local and state emergency offices and schools about their response plans. Be prepared to follow official guidance. Be informed. Make a plan. Build a kit. Educate and protect your family, neighbors, and friends. Follow evacuation orders issued by authorities. Evacuate immediately from an erupting volcano! Be aware that lahars and other types of landslides or debris flows can travel great distances from the volcano. Avoid river valleys and other low-lying areas that may be prone to these hazards. If you are in a lahar hazard zone and become aware of an oncoming lahar, get to high ground and then shelter in place. If there are signed evacuation routes, follow them. Stay informed: Watch and/or listen for additional information. Listen for All Hazard Alert Broadcast sirens that warn of lahars. Do your part to remain safe and help others in need. Volcanic ash is made of microscopic shards of glass and other fine-grained material. Ash can can cause significant damage to animals, including significant damage to lungs or asphyxiation if inhaled. If there is falling ash and you cannot evacuate, remain indoors with doors, windows, and ventilation systems closed until the ash settles. Help infants, the elderly, and those with respiratory conditions. Wear a respirator, face mask, or a use a damp cloth across your mouth to protect your lungs. Use goggles, and wear eyeglasses instead of contact lenses. Avoid driving in heavy ash fall unless absolutely required. If you must drive, reduce your speed significantly. Avoid operating engines of any kind. Ash can clog engines, damage parts, and stall vehicles. Keep roofs free of ash in excess of 4 inches. Limit outdoor activity. Remove outdoor clothing before entering a building. Check to ensure that ash does not contaminate your water. If it does, use a different source, such as bottled water. For more information about ash fall, check out the USGS Volcanic Ash website. Stay informed: Watch and/or listen for additional information. Listen to NOAA Weather Radio, watch TV, listen to the radio, or check the internet for official instructions and information. Do not approach the eruption area. Be prepared to stay indoors and avoid downwind areas. Be aware of lahars and landslides. These hazards can occur long after the main eruption. 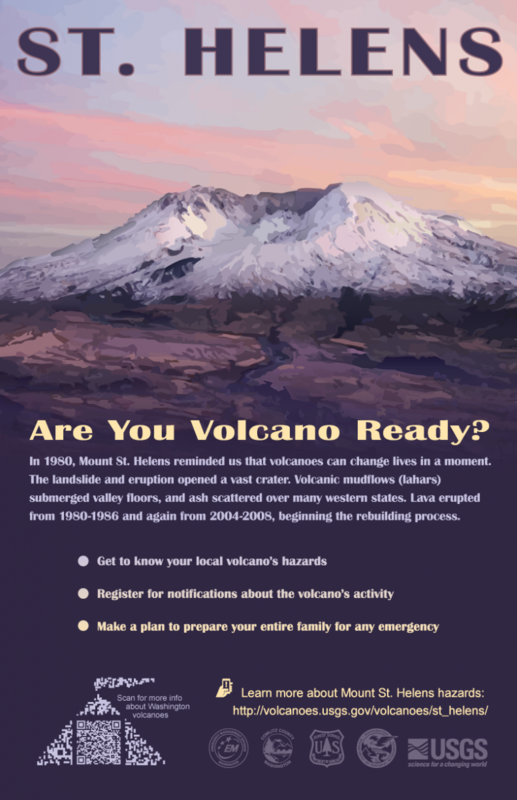 Click on the volcano icons below to find lots more online resources to inform you about emergency preparedness, volcanic hazards, emergency notification systems, and evacuation plans. A volcano is an opening in the surface of a planet (or moon) that allows hot material to escape from the magma chamber below the surface. When the hot material, such as lava, ash, and gas make their way to the surface, the volcano erupts. The style of eruption depends on the type of volcano. Eruptions can be explosive, sending hot mixtures of ash and gas high into the sky; or they can be calm, only sending small amounts of lava down the slope. Volcanoes are created when hot magma beneath the Earth’s crust rises to the surface. The crust is broken into tectonic plates that float on the hot mantle beneath. Subduction zones, mid-ocean ridges, and hot spots. Image modified from Nasa SpacePlace. 1) Subduction When tectonic plates bump into each other (converge), one of the tectonic plates can be pushed under another one deep into the Earth under the crust (called subduction). The tectonic plate that was forced downward then melts from the high temperatures and pressures, generating magma. Magma can eventually rise to the surface, forming a volcano. The big volcanoes in Washington were built in this way. 2) Mid-Ocean Ridges When tectonic plates move away from each other (diverge) the hot, buoyant magma beneath the crust rises to fill the space. This typically happens in oceanic crust underwater and forms “black smokers”. 3) Hot Spots The third way that volcanoes can form is at a hot spot inside the Earth. Scientists are still figuring out exactly why hot spots happen where they do, but the basic idea is that magma rises and pushes its way to the surface through the tectonic plate. Yellowstone and the Hawaiian islands are two famous examples of hot spot volcanoes. Volcanoes usually form at the boundaries of tectonic plates (where the Earth’s crust moves apart or collides). The Ring of Fire is a horseshoe-shaped “ring” about 25,000 miles long that circles the Pacific Ocean. It is called the Ring of Fire because that is where most of Earth’s volcanoes are found. The Ring of Fire is also a Johnny Cash song to which geologists love to make their own silly volcano parodies. There are 452 volcanoes in the Ring of Fire, and it is home to 75% of the world’s volcanoes and about 90% of the world’s earthquakes. 3D Story Map about the Ring of Fire, by Esri. View in fullscreen. Are all volcanoes alike? While many people think of a volcano as cone-shaped mountain that spits red hot lava and has a plume of ash like the one shown below, in fact, there are multiple types of volcanoes. The shape, size, and lifespan of a volcano depends on its location (under the ocean, at a convergent plate boundary, a hot spot etc. ), the chemistry of the magma that erupts from it, and the amount of ash and lava in the eruption. Depending on the chemistry of the magma, the volcano can erupt either explosively or non-explosively; the style of eruption also affects the overall shape of the volcano. While other types exist, the three most common types of volcanoes are cinder cones, composite volcanoes (stratovolcanoes), and shield volcanoes. Diagram of a cinder cone, modified from image on DKfindout. Cinder cones, the simplest type of volcano, are steep cone-shaped hills made up of cooled, air-filled lava, called cinder or scoria (commonly referred to as lava rock) that were ejected from a single vent. Cinder cones are commonly found near shield volcanoes or stratovolcanoes. Some only erupt once such as the famous Paricutin cinder cone (video below), while others may erupt many times. Diagram of a stratovolcano, modified from image on DKfindout. Composite volcanoes or stratovolcanoes, are typically some of the world’s most beautiful and beloved mountains. All the major Cascade volcanoes including Mount Rainier and Mount St. Helens, as well as Mount Fuji, Mount Vesuvius, and Krakatoa are stratovolcanoes. These beautiful mountains are what most people think of when they picture a volcano—steep-sided, symmetrical cones that typically have a crater at the summit. Stratovolcanoes can be very tall, many are more than 14,000 feet, and are built from alternating layers of volcanic ash, lava flows, and cinder. A stratovolcano forms from conduits where magma travels from deep within the Earth to the surface through a central vent which connects to multiple radiating dikes and secondary vents. Stratovolcanoes are commonly found at convergent plate boundaries, such as along the edge of the Pacific Ocean within the Ring of Fire. Stratovolcanoes can erupt explosively (see video below) and can cause great damage to people living near them. The biggest hazard for people living near stratovolcanoes is not from lava, which moves slowly down the volcano, but from lahars (fast-moving volcanic mudflows) that can barrel down the slopes of the volcano at incredible speeds (up to 120 miles per hour!) destroying everything in their path. Diagram of a shield volcano, modified from image on DKfindout. Shield volcanoes are the largest volcanoes in the world. They are called shield volcanoes because when you look at them from afar they resemble a warrior’s shield. Mauna Loa, a shield volcano on Hawaii’s big island is the largest single mountain on earth. It reaches 30,000 feet above the ocean floor and is approximately 100 miles across at its base. Shield volcanoes have shallow slopes and are made of layer upon layer of cooled lava that flowed down the slope in all directions from a central summit vent, or group of vents. Lava can also erupt from fractures or fissures along the edges of shield volcanoes. Loss estimation analysis for areas near volcanoes. As of 2015, we have completed this analysis for areas near Mount Rainier. Loss estimation and multi-hazard analysis for all other areas near volcanoes and for all counties in Washington. These analyses are currently underway. The Survey works to increase public and scientific understanding of volcanic hazards in our state through efforts such as this website, field guides, and other public outreach. We work closely with the Washington Emergency Management Division, the U.S. Geological Survey, and local counties to develop and publish educational material and information about evacuation. The Survey is the lead science agency for the State during times of geologic emergency. During these times we assist other emergency planners and responders, such as the Washington Emergency Management Division, in making geologically sound decisions. In cooperation with the U.S. Geological Survey and several Emergency Management Departments from local counties, we have developed a series of posters to promote awareness of the hazards posed by the five active stratovolcanoes. In cooperation with the U.S. Geological Survey and several Emergency Management Departments from the state and local counties, DNR has recently developed interpretive signs that inform the public of the hazards posed by Mount Rainier, Glacier Peak, and Mount Baker. These signs are already on display in several local communities surrounding the volcanoes! DK findout! Find Out About Volcanoes!